From the observations made at the two craft markets I did running up to Christmas, I have decided to rethink how I present my Art-Brooches. Despite having printed information, it was quite obvious from every visitor I spoke to, that they did not realize it was a detachable brooch in the frame. So, rather than selling the complete package, I think I will have to sell the Art-Brooches on their own, with the option of purchasing frames to keep them in. I have been working on some more brooches (CF023 - CF031), using Friendly Plastic, but all the time thinking about future designs that will incorporate other materials for contrast. 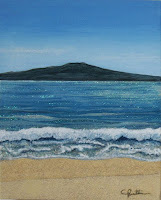 As there is no market at St Heliers in January, I have booked to do the big art and craft market at Mission Bay, on Auckland Anniversary Day (1st February 2010), which should be a great event if the weather is good. My plans to do some experimenting, over the Christmas holiday time, with mould-making and casting did not exactly go to plan. We have today, just signed up to move into a great little apartment, right on the beach front, in a couple of weeks time. It is, however, in a totally different location – Browns Bay on the North Shore. I only managed to have one small go with the casting resin (Easycast) kit but the pieces I made were very thin, so I found that they snapped if you bent them. I do not know how thick a layer it needs to be to have the strength but this has ruled out using it to make the thin additions to my 'cast' brooch ideas. I then started to think maybe polymer clay? But that may well be the same when in a thin layer. I have not had a chance to try the silicone (Pinkysil) for making moulds (I used the reusable KleanKlay) or the doming resin kit, to compare with the Envirotex Lite that I have used previously. After reading all the data/safety sheets for the resins, I do not know how I feel about using them long-term. Anyway, my creative ideas will have to go on hold for the time being, while we pack up, move in and get settled in our new place. Limitations on space in the new apartment and reorganizing my creative time to fit in with our commute to work means that I will most probably have to change the medium I am working with – it could be a return to Paper Mosaics. So the New Year may well bring a new direction to my art/craftwork. 'Winter Splendor' Design Challenge - Winner? It appears that I may have won the Winter Splendor Design Challenge, as mine was the only entry! This is my entry, which is titled 'Frosty Quarters'. It was a bit of a rush for me to get something done, with two Christmas craft fairs and other Christmas preperations going on in December. Over the last few weeks, I have been sketching out ideas and trying to work out how I would make moulds for brooch bases, which I can then add to/embellish to make each one different. I am a bit torn, as I like the idea of making my own moulds and casting (this would help to speed up production) but I still want to keep my pieces as ‘one-off’ originals (even though people do not seem to fully understand what this means). Before I plunge into another new thing, that requires more materials, tools, etc, I am hoping to get some little kits (one for making moulds and one with resin for casting) to experiment with over the Christmas break. This should be fun and will give me an idea as to whether I am going to pursue this line of thought further. Following my first public sales event on the first of this month, I have spent my creative time making butterfly brooches, which was not as easy as I thought to make purely from FP. After many attempts, which looked flat and clumbsy, my last butterfly (CF022) finally captivated the look I was trying to get and I only deemed this one good enough to be sold as an Art-Brooch. I have also spent a lot of time thinking about combining FP with other materials in my brooches, as I am keen to get different surface textures, particularly matt surfaces to contrast with the high gloss finish of the FP when it has been coated with Envirotex Lite. Although the design stage is still in my head at the moment, I am thinking of making some moulds from my own designs. This would enable me to cast part of the brooch base (either in resin or clay) relatively easily, so that I can concentrate my time on the inlaid designs with FP and other materials. I may also have come up with a different type of fastening pin that could fit flush into the back of the brooch, so that it would fit into the frame better (which I am also considering casting from my own design as well). Lots more to think about for December! I went to visit Topmark Products, to see the range of model-making supplies available, after making contact with the Director of the company at the recent St Heliers Art and Craft Market. I was totally inspired by the vast range of products and felt sure that I would end up satisfying a latent desire to design and make my own moulds and castings. 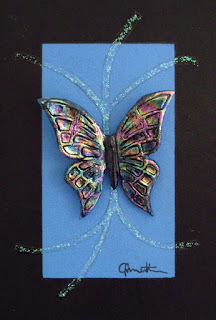 Today I posted off my butterfly design for the AMACO Friendly Plastic Butterfly Design Challenge. It is called "Rainbow Shimmer". This was made very quickly at the weekend, to take advantage of the extended deadline for entries. 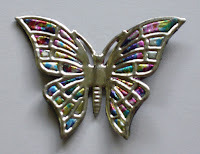 This butterfly was made by pressing FP from behind through a preformed metal butterfly shape. Next I need to try making some butterflies, just from FP, using the marbling technique. I have a commission for a butterfly brooch and said I would have a few to choose from at the next St Heliers Art & Craft Market. 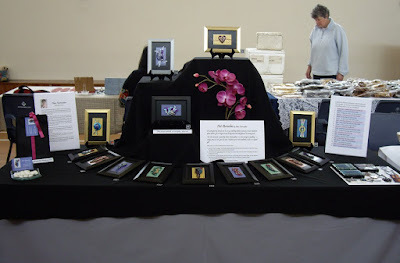 The first public showing of my Art-Brooch designs took place at the St Heliers Art & Craft Market on Sunday 1 November. This was also my first craft fair in New Zealand. I believe this first event was quite successful considering that visitor numbers to the market on this particular Sunday were extremely low, due to other events going on in Auckland on the same day. This included the Auckland Marathon, which resulted in one of the main roads from the city to St Heliers (and the Harbour Bridge) being closed to traffic. I was pleased to hear most people say what a great idea the Art-Brooch concept is and that they have not seen anything else like it before. I have been fairly limited in the amount of time I have had available to build the collection of Art-Brooches for this first event. However, I am inspired with ideas which need to be developed to refine the concept and also for new designs to add to the collection. Today, I was the 'feature artist' on The Art of Friendly Plastic blog. 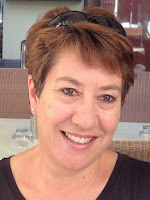 I am writing this early, as we are going away, to Tauranga, for Labour weekend – a much deserved break! I have worked really hard this month to complete my first 20 Art-Brooches (in addition to the first one, which I am keeping for myself) for my first New Zealand craft fair on 1st November. I have had to use bought frames for displaying my brooches, due to time time constraints, but I intend to work on the idea of designing and casting my own display frames in the future. To save space, the following photos have been cropped, so the frames are not shown, but hopefully they give an idea of what my Art-Brooches look like. It is now seven months since we emigrated from the UK and one month until my first craft fair in New Zealand (St Heliers Art and Craft Market), which is booked for Sunday 1st November. 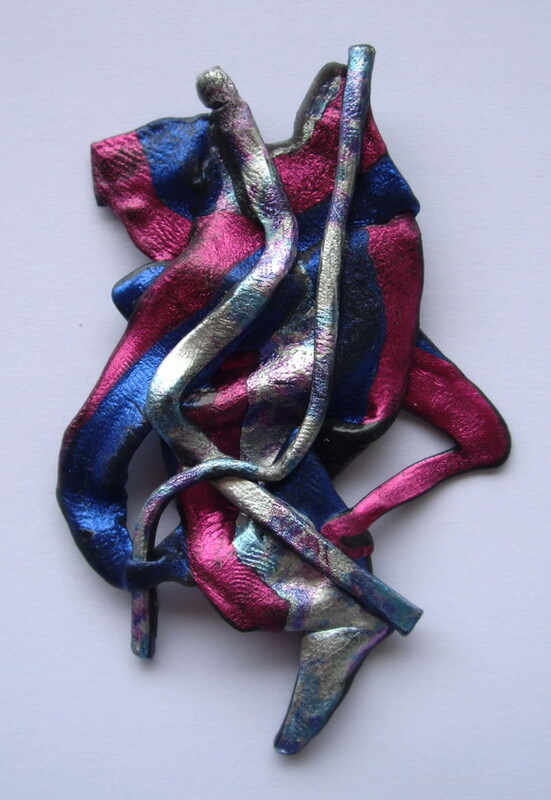 This will be the first showing of my Art-Brooches, to gauge public reaction to my idea for a new concept in jewellery. When I left home this morning, there was a rainbow – so I hope this is a good omen for things to come. I have bought the domain name www.clairefairweather.co.nz, so I can develop a website to start off my Art-Brooch venture here in New Zealand. Looking to the future, with a view to selling internationally, I have also bought www.art-brooches.com. I really need to stay positive and focused – and hopefully, my determination to succeed will make my Art-Brooch idea a success. I have enjoyed playing around and experimenting with the Friendly Plastic this month. It really is quite addictive, if a little uncontrollable for my liking. Sometimes it is difficult to know when to stop – or you realise you should have stopped when it is too late. I am really excited about my idea for Art-Brooches, as I think this is something different and hopefully unique. I have searched on Google and have not come across anyone else with a similar idea. So many people seem to sell jewellery at craft fairs, I have never considered it before as I like to be different, but on looking round very few seem to have brooches. This may be because brooches are considered a bit ‘old-fashioned’ but I hope my ideas for presentation will make the brooches quite contemporary. Also, the Art-Brooch concept is a good transition for me from ‘art’ to ‘jewellery’. Working at such a small scale, creating the brooches, is something I am not used to. However, it should be much better for my neck (years of bad posture, leaning over large pieces of art/craftwork, have given me permanent neck discomfort) and I am currently seeing a chiropractor to try and help with the neck problem. Other advantages of working small scale are that it does not take so long to complete a finished piece (which is good as I am currently working full-time) and, when I come to pack up all my sales items for my first craft fair, everything should fit in one, light box. The latter is fantastic – no more lugging back-breaking boxes in and out of cars, etc. 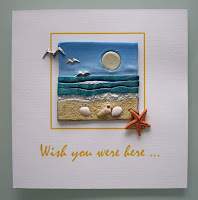 Tonight I submitted my card design for the 'Surf & Sand Design Challenge', on the Friendly Plastic Blogpsot. Today, I believe I have hit on a really unique style for my Art-Brooch designs – and it was all a ‘happy accident’. This morning, I was really excited about making my first ‘Art-Brooch’. I had drawn out the design, made up of overlapping triangular shapes of different sizes, and chosen some of my favourite colours of FP, as I thought I would keep the very first Art-Brooch for myself. I am still learning and my first attempt at fusing the different layers did not work perfectly, as some of the triangular shapes sagged when I built up the layers. Thinking about how I could overcome this problem, I came up with an idea. So I made another one, using exactly the same coloured pieces. It still was not perfect (although the idea was simple, it was actually not so simple to construct) but it was technically better than the first one. Just for fun, I thought I would put the first piece on the griddle pan and swirl it about when molten with the needle tool. This I did and it ended up looking fantastic. It was so satisfying creating the piece, as it was similar to ‘marbling’ (which I find fascinating and love doing) but more ‘free-form’. The flow of the swirling lines and colours really brought it to life, it looked so much more interesting than the stilted ‘angular’ design I had originally planned. It is also totally unique – I could never create another one exactly the same, even if I used the same coloured shapes to start with. I then made a third piece (using exactly the same coloured pieces again) and worked it even more. By chance, the original triangular shapes, which I had randomly drawn, ended up looking almost flower-like. The photograph below shows the three pieces and the transition from angular to freeform design. They have all been sealed with a coat of Envirotex Lite. It would take some thought, trial and error to work out what a finished piece might look like, depending on the starting shapes and the swirl lines made with the needle tool but I suddenly feel inspired to create pieces reminiscent of flowers, leaves, waves, landscapes, in fact anything natural - as there are ‘no straight lines in nature’. Due to the free-form nature, the end result may not be that predictable but I can always add some embellishments or paint in some additional detail, if required, to enhance the design. So, I think this ‘happy accident’ has transformed my design ideas for the Art-Brooches, resulting in a technique that is so enjoyable to do and will create totally unique pieces – I just cannot wait to do more. We have now been living in New Zealand for six months and I cannot believe how quickly the time has gone by. After some initial experimenting, I now know where I want to go with Friendly Plastic, so I must get on with some serious designs, focusing on developing my idea for Art-Brooches – a unique piece of ‘art’ you can wear. After the thrill of winning the random selection prize in the Design Challenge, I have now got down to working on some designs for things to make with FP, apart from jewellery. I have made some different shaped 'tile' pieces to put together to make a small 'mosaic-style' design. 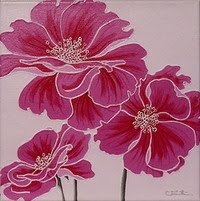 I have several small MDF block canvases and have worked out a couple of different mosaic-style designs for these. I am also thinking about decorating the large round mirror frame that I have. I still need some more materials and equipment but am working on this. I have now got a monthly 'pocket money' allowance, which means that I can at last start ordering what I need. Getting things here in New Zealand is proving to be the main problem - virtually everything has to be imported - so it all takes time (and extra cost!). Not good for an impatient person! I have lots of ideas, which is good. I am just having to work on designs/ideas at the moment, until the materials arrive. The only thing I have not sourced yet is Envirotex Lite, to seal my finished pieces. I found out this evening that I have won the 'random draw' prize in the Marbling Magic Design Challenge. I am really delighted, as this was my hope when I entered the competition - I did not expect to win the 'voters choice', as my designs were very simple with the limited resources that I currently have. I received an email from Jana Ewy, asking what my favourite colours of FP are - so she can make my prize to suit. I am intrigued to see what arrives in the post and am also full of inspiration to get creating. I am taking this win as a sign that FP is my destiny. These two paintings, titled 'New Zealand Landscape' and 'Pampas' are to hang in our apartment, for the time being. The landscape one was inspired from a photograph in the flight magazine, on our journey out here. (Note: Due to photographing indoors with poor light conditions, the colours in these photos are very intense, particularly the sand which looks very yellow, when it is actually much paler). This afternoon I finally finshed my last painting, which now means I can concentrate all my spare time on working with Friendly Plastic. I had a quick go at softening FP in hot water. After all the set up of filling my electric frying pan with water and using a thermometer to get it to the right temperature (60-70 degrees Centigrade), my first attempts did not work that well when trying to fuse strips together. I then tried softening some plastic to manipulate three dimensionally - that did not work well at all. It seemed a lot easier to fill a cup with near boiling water and just dip the item in quickly, guessing when it was ready. I obviously need to spend more time working on this technique. The results of the Marbling Magic Design Challenge should be decided and posted in a few days time. Unfortunately, I have been unable to do any more work with Friendly Plastic this month, after submitting my entry for the Marbling Magic Design Challenge. My time has been spent doing full-time temping work. Today is a day off but I am trying to finish two outstanding paintings for our apartment. Tomorrow, I am going in for an introductory day before starting my new, permanent job on 1st July. Once I get started in my new job, I need to make time available for continuing my 'Journey of Discovery' with Friendly Plastic. Yesterday, I submitted my entry for The Art of Friendly Plastic 'Marbling Magic Design Challenge'. 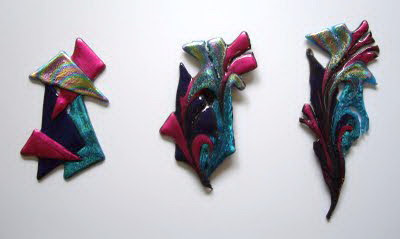 The challenge was to design three or more pendants using various marbling techniques. The three pieces I finally submitted bore no relation to my original design ideas (some of which did not work out so well and some I was restricted by a limited amount of tools and accessories) but I felt these were reasonable attempts for a novice. The closing date was 15th June, which was a bit of a rush, as most of this month has been taking up with 'temping' work, job interviews and negotiations. After I had submitted my entry, I found out that the deadline for the competition had been extended to the end of the month. Never mind, it is done now. I will just have to wait with curiosity to see the standard and designs of the other entrants, when they are posted for voting. "I have always loved iridescent/metallic colours and have been fascinated by fused glass – I believe Friendly Plastic will allow the creation of similar effects without some of the limitations – it is full of creative potential and an exciting new medium to work with." I cannot remember how I came across Friendly Plastic, since moving to New Zealand. I had seen it many years ago at a craft fair at Alexandra Palace, London - it was the bright metallic colours that caught my eye, when passing a jewellery stand. I think because it had been used for jewellery, I did not think of using it myself - I had not appreciated the full potential of the product. Anyway, I am just glad to have rediscovered FP. I have been thoroughly enjoying creating pieces of marbled Friendly Plastic - it gets quite addictive. Although jewellery is something I have never made before, I intend to make the best pieces into pendants, to enter The Heart of Friendly Plastic 'Marbling Magic Design Challenge'. The deadline for this challenge is 15th June - I will post a photograph of my competition entry. I have also ordered lots of exciting goodies from www.rarebird.ltd.uk in the UK - this website seems to have the greatest range of accessories for, as well as colours of, Friendly Plastic. I just cannot wait for this order to arrive. So far, I have just been experimenting with marbling for this challenge but I know there is so much more to try and learn. My main idea at the moment is to make mosaic tiles out of Friendly Plastic, reminiscent of fused glass, for creating pictures and decorative mirror frames. One of my first pieces of 'marbled' Friendly Plastic. I was enjoying myself so much I started to cut it up, to make a pendant, before taking a photograph, which is why there is a cut line down the middle. 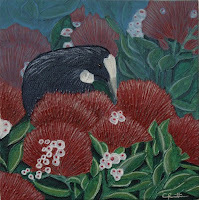 I guess everyone has to paint Rangitoto and Pohutukawa flowers. I have completed these two small paintings, titled ‘Rangitoto Island’ and ‘Amongst the Pohutukawa’, to take to Auckland East Arts AGM and party tomorrow. I have joined this art group, after seeing their exhibition marquee at the St Heliers Festival, with the hope that it might provide some opportunities to exhibit. My second order from ZigZag arrived very promptly, again. I now have a further 20 sticks of FP and a ‘marbling comb’. I also rushed out and bought an electric frypan, so I can use the griddle method recommended for marbling. So now I am all raring to go! I have joined the Friendly Plastic Yahoo Group and also discovered the Friendly Plastic Blog, http://friendlyplastic.blogspot.com. Through this I received notification of the 'Marbling Magic Design Challenge' – a competition to design up to five pendants from Friendly Plastic, using marbling techniques. 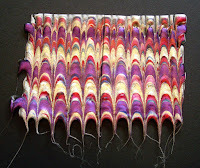 As I want to try marbling, I thought this would be a good thing to enter, as it would give me something to make from my practice pieces, even though I have never ventured into jewellery before. Also, the prize is a stash of Friendly Plastic, which would be good to win, as I need to build up a stock. I will need to order some more supplies first. Yesterday, I ordered a some strips of Friendly Plastic out of curiousity, from www.zigzag.co.nz. To my amazement they arrived today - I could not believe how quickly they came. And what fabulous metallic colours. Without having all the necessary equipment, I just had to have a play with it and I was pleased with my first attempt at melting the plastic. It definitely has potential and I feel fired up with enthusiasm. On 28 February 2009, I emigrated from the UK to Auckland, New Zealand. A naturally creative person, I have tried most types of painting media and many crafts. This new chapter in my life has brought renewed inspiration and also a new medium to try – Friendly Plastic. This blogspot will replace the paper diary I used to keep, for recording some of my creative thoughts, ideas and experiences. As I write this, I intend to experiment and perfect my techniques with Friendly Plastic. However, from my past record, as time goes by my working medium may change and so this blogspot will change and develop too.